Thrunite has just released the new TC15 EDC with XHP35 making a listed 2300 lumens. I have a sample on the way for review at this time and I will be posting that within the next 10 to 14 days , as I do not have it in hand just yet. Thrunite asked me to share some information at this time to help spread the news about this little powerhouse though , so I thought I would do what I can without actually having the light in hand. They ask for UNBIASED reviews of the TC15 and NO special request other than your honest review of the TC15 if you do purchase one of these lights from Amazon. For those who use Facebook they are also doing a GW there if you “like” and “share” the post. First I will say that ALL my Thrunite products so far have been of excellent quality ( I think 15 or 16 now) so I expect that this new TC15 will be no different. The TC 15 will be available in CW or NW , has USB onboard charging and comes with a 3100mAh Thrunite branded cell and charging cable. OK light now in hand and so on to the full review………. This is the ThruNite TC15 , sent to me for review from ThruNite and NO other compensation other then keeping the light. ThruNite 3100mAh 18650 IMR Battery , USB Charging Cable , Spare USB port Cover and a Spare Side Switch Insert. This is an 18650 sized EDC with plenty of lumens for whatever the purpose may be , ranging from 2300 listed lumens in Turbo , all the way down to 1 listed lumen in firefly mode. The size is very comparable to the always popular BLF A6 and other 1 inch tube lights. 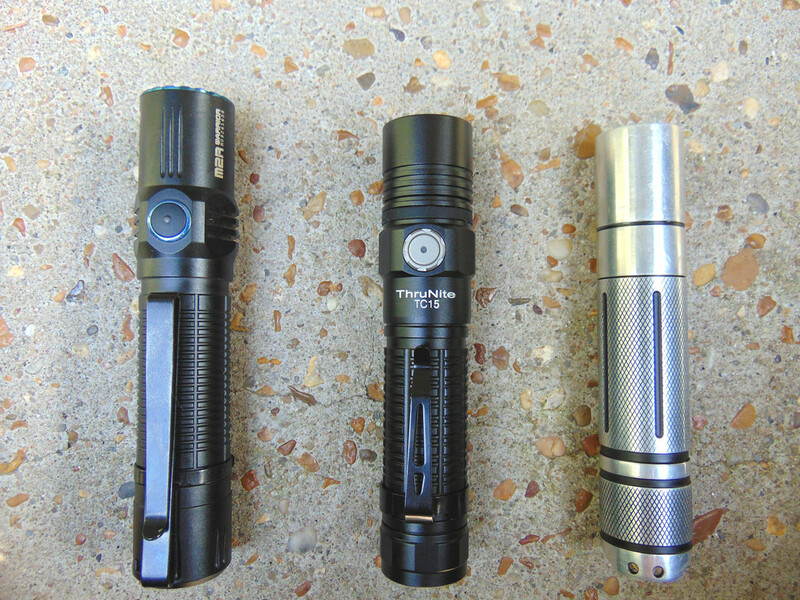 Shown here with the Olight M2R Warrior and the A6……. The styling is pleasing to my eyes (I know opinions will vary) and the ribbing in place of the usual Knurling , not only looks good to me , it also provides a good grip and feels good in my hand. The Included nylon holster is lightly padded inside and fits the light well , while having a belt loop holder and a plastic loop for attachment to a backpack or other desired places with the help of a carabiner or other such anchor or hook. 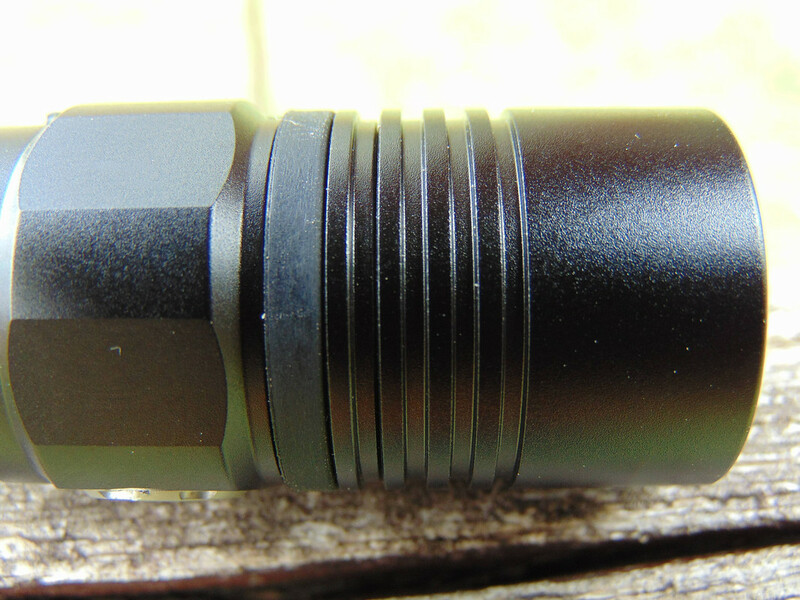 The Branding , or etching is also done well and I have found no thin or bare spots on the anodizing anywhere. The clip is made sturdy and attaches with a good amount of force , it seems to stay in place well once attached to the light , while holding firmly when attached inside my jeans pocket also. The fins are not large , as the light is not itself large , but for the small size , it seems ThruNite got the thermal regulation set about right to handle the large amount of heat coming from this light. All of the threads are well cut and smooth on this light and they were lightly lubed upon unpacking. The Cell can be charged either with the USB onboard charger , or the cell can be removed and charged externally on a traditional charger. I have also tried High Drain button top cells of various brands and they all seem to work fine in the TC15. The High Drain Flat tops however , are too short for use in this light. 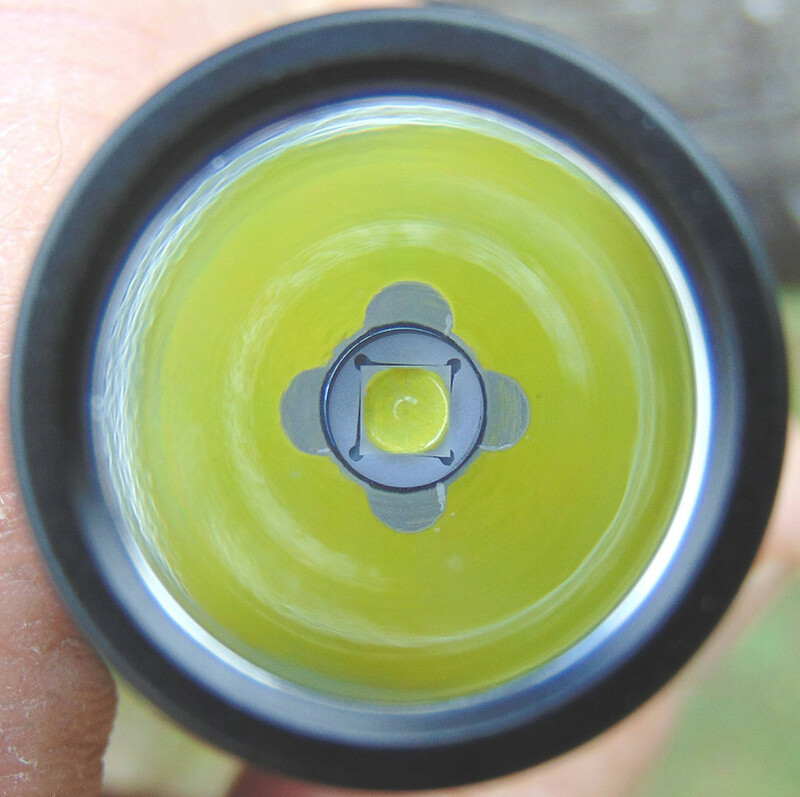 They will let the light operate , but with a bump or decent shake , the light will usually go off or change modes when using the flat top high drain cells. The side switch button is like many of the ThruNite switches and it is a nice metallic button. The center of the switch is lighted to indicate power on (Blue) , Low voltage (Red) and improper charging or other problems with the cell (purple). When the cell capacity is at 20% or above the Blue indicator will show (other than Firefly mode) , at 10% to 20% the Red indicator light will come on and stay on steady. At 10% or below the Red indicator will then start blinking Red to let you know the cell is depleted. Once the cell is fully depleted the Low Voltage Protection will simply shut the light off. The driver seems to be well regulated , as I checked the lumens with the included cell in Turbo mode and low mode , a Samsung 30Q , LG HE4 and an Efest purple high drain. All were within around 40 lumens of each other when tested in Turbo and in low mode all were within 2 lumens on my light tube / meter. The run times and lumens listed by Thrunite also seem to be fairly accurate , as I know they will not be exact on every light no matter what company makes the light. 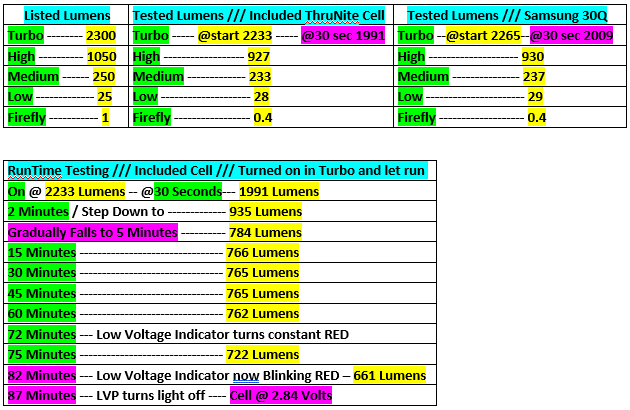 Below is my test results for the lumens using the included Thrunite 3100mAh cell and a Samsung 30Q for comparison. The run time testing was done with the Thrunite cell only , because I figured the results would reflect what the Lumens test showed with other cells also. The beam is a nice defined hotspot that is not small but not too big either. There is little to no corona and plenty of useable spill for walking and such. Overall I am liking this one very well and so far it has done well in my testing and short time so far of EDC’ing the TC15. I think ThruNite has another winner with this light IMHO. For those who may not want to watch the whole video , but want to see the live footage comparing the TC15 with the Wowtac BSS V3 and the Olight M2R Warrior outside , that footage starts at 11:11 of the video timeline. Video followed by listed specs and features………..
•LED: CREE XHP35 LED with a lifespan of 20+ years of run time. •Runs on: 1 × 3100mAh 18650 IMR battery (included). Strobe (830 lumens /180 mins). •Power interface: micro USB charging port. •Waterproof to IPX-8 Standard (2 meters). •Dimensions: 122.5mm (length) x 27mm (body diameter) x 24mm (head diameter). ThruNite 3100mAh 18650 IMR Battery x1, USB Charging Cable x1, Spare USB Rubber Cover x1, Spare Side Switch Cap x1. •We suggest to charge the battery in the TC15 light. During charging, the indicator is RED; After being fully charged, the indicator will be BLUE; When indicator flashes purple, it means abnormal charging. Only firefly and low mode is available duing charging. Great review, David - Thanks!! Thank you also Martin , always glad to do the reviews. want to put a thank you out there also for getting that embed code working for the video links. It works like a charm and very easy to use. I'm trying to buy it offline. If you are able to order from Amazon where you live , the light is actually $10.00 less from the Amazon / Thrunite store , than it is on the main Thrunite site right now.